Help save an Argonian who was injured in a troll attack. 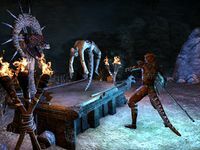 Trolls overran the town of Darkwater Crossing, and now the Argonians who lived there have taken refuge in a nearby cave. Find Stormy-Eyes' key and collect torchbug wings. Talk to Asmalah the Caller.